This blog contains part 3 (of 4) of notes made during 1stNew Timeline Ascension Conference by Cobra in Budapest on 14 & 15 April 2018. The production of these notes has been a co-creative effort of Hanneke van Ginkel and Jacqueline van Rijswijk. Incarnation is your own choice and a combination of Free Will and circumstances. The dark forces can push you into reincarnation and you can be tricked into false light. The dark forces can give you limited options in, for example, your choice of parents, so that you do not wake up or are able to manifest your light. However, if you are able to overcome this, hold on to your inner light and succeed to fulfil your mission there is no stopping you. Sometimes you get the right parents and it is much easier. This situation is different every time and needs to be viewed case-by-case. Using the manifestation process is KEY to your life and mission. A lot of books have been written about this, but all the information is incomplete. Many are frustrated about that. Manifestation is an exact process: every thought and every action create ripples through this infinite field of consciousness. It is a Law of Physics. 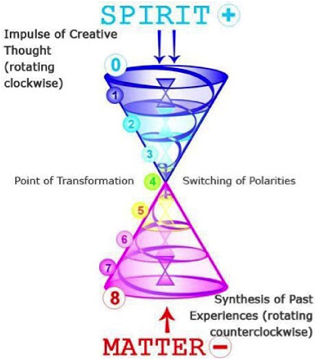 In the third dimension manifestation goes slower than in higher dimensions, but the process is the same. The Free Will of most people is not clear. They do not know what they want. The dark forces use this. The Rothschild’s made the New World Order decision 250 years ago and they knew only their grand grand grand children would see it come to fruition. Their Free Will was so strong they ALMOST made it. Your decision needs to be clear enough. With clear decisions we become powerful both individually and collectively. Getting clarity is the most important element. Ask yourself: What do I REALLY want? These regard your choices, priorities, desires etc. and make NO compromises. When it is yes, it is yes! When it is no, it is no! However, getting clarity requires being absolutely honest with yourself. If you are not honest, you have no clarity and without clarity, you can’t manifest. When you get clarity in your decisions and priorities then your Free Will sparks like a diamond and you will start manifesting. Reality will adapt to your decision. The whole Universe will change to the new vibrational pattern. The energy around you will rearrange. If you were able to see the energies around you, you would see this complete rearrangement. These blocks shape a large part of your destiny. They make you adapt and compromise on what you want. Do NOT compromise on what YOU want. This creates energy blockages in your manifestation process. Next to that, it is easier to live without compromise. The Matrix has been structured to make you believe that compromising is the way to get what you want. Or that it is not right to want anything for you. You are taught to be something. You need to clear yourself from the compromises. For instance do NOT get married for a visa or lie to get your point across. When you are clear your Free Will becomes like a diamond, a crystal. When you begin to re-align your decision to what you want, you begin to stand face-to-face with society and your parents. E.g. a father wants his son to become a doctor, but his son is, in essence, wants to become an artist. The son wants his father to love him and decides to compromise on his deepest desire to become an artist, and becomes a doctor. The result is that the son is not happy. Compromising is one of the reasons for so many burnouts at this moment. You can invoke your decision by imagining, visualizing, desiring, feeling, praying and dreaming about it. It is not about empty fantasizing; it is an emotional process and when you are clear you can imagine your dream into reality. When you fantasize a lot about something there is a Higher Purpose. It happens for a reason. It can be anything. It is unique for each person, regardless what society says. This is the key to your mission. It is not about working hard. It is something you are very compassionate about and want to do deeply. Your imagination is key and the map to your mission. However society might disapprove of it. If you do not take physical action, nothing happens. You need to take a STEP towards your decision and invocation. This is not always the case, but mostly. The principle is the same for manifesting anything. We can manifest The Event by making a clear decision, invoking it and taking action. Many have taken the decision, but only few are taking action on the physical plane. Many are waiting for another update of the blog. Everyone needs to DO something. Create a group and take physical action. We need a group of co-creators to manifest a joint vision of The Event. We all have a piece of the puzzle. 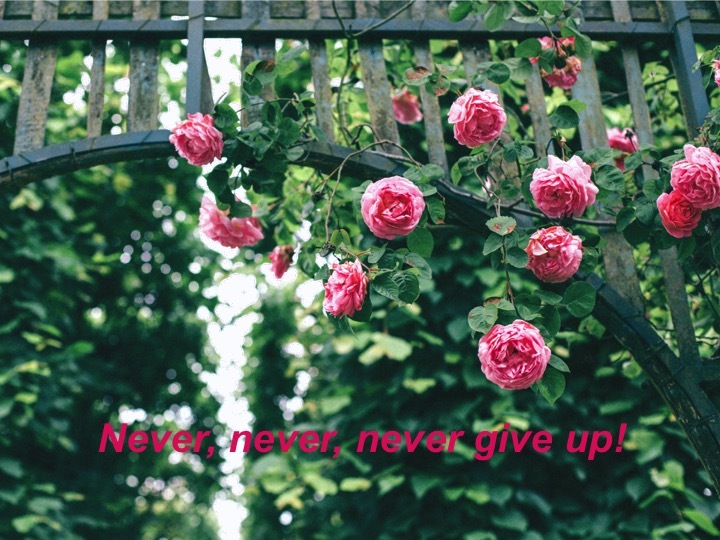 KEY: DO NOT GIVE UP! Manifest what you want according to the process and repeat and repeat. Keep going until it happens, as manifesting takes time. The time required is different for everything. 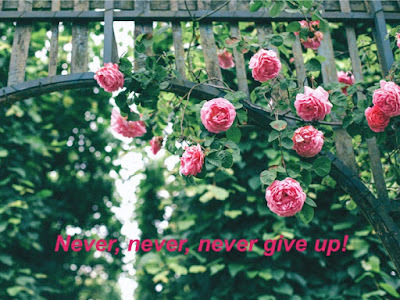 DO NOT give up in the middle of the process. This will disrupt the manifestation process. Spread the idea of The Event into the mass consciousness. This will help to manifest The Event. Communicate it widely to individuals. Many people want it, but do not know it exists. Make them want it. Through video’s, art, a blog, your own words. Communicate it in your own way! The population will not settle for less, they will want more. The dark forces will test your decision. They search for doubts, fears, insecurities and attack you on these weaknesses. However if you are 100% sure, they can’t do anything about it. They might attack people around you, for instance by giving them a physical problem. That is unfortunate, but these people need to work at this themselves. A shaman for example is a catalyst for transformation, but the person has to do the changing themselves. Archons are testers, unpleasant, but they will be removed. There is no mercy for them. Decision, willing to take a risk, is what transforms. Free Will is strongest, so they will lose! St. Germain supports the manifestation process. During invocation call upon him and connect with him for support. A decision is a reflection of your I AM presence. Manifestation is what St. Germain has initiated and wants most. Your I AM presence is your Divine Will. St. Germain created this process through inner alchemy. This creates the Divine marriage between your personality and Soul and manifests the Will of the Soul. In other words: the Will of the Soul manifests through inner alchemy to outer alchemy. The Galactic Confederation has advanced manifesting technologies available to them. One of these technologies is reality shaping. When you make a decision you mould and shape space/time. Space and time are not solid; they are shapeable and adapt to Will Presence. It adapts to the strongest Will Presence in a certain area. Physical matter is made of subatomic particles that only appear to be solid. It is not. It is a vibration called a standing wavein physics. If we influence the underline of physical matter, we can transform and change it. We call this the quantum reality. 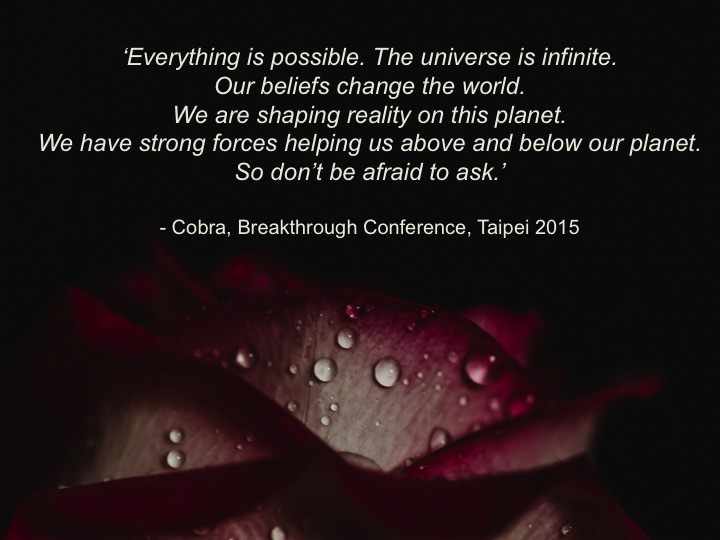 Quantum reality can be changed by technology and by consciousness. The easiest way to shape reality is to focus your attention on it (i.e. the desired reality). “Energy flows where attention goes”. The focus will increase it in your reality. If you think about something, this will happen. It is the Law of Attention. You can use this principle to manifest abundance. Many Light Workers have problems with money. So, buy a silver coin. Put it in your pocket and take it with you. Look at it every day. Focus your attention firmly on it, then more will come. When you’ve got enough silver coins, move to gold coins. When you focus on something every day a vortex support field is created. Make a map and visualize it, act on it. Sacred Geometry can harmonize your Free Will / decisions in a more exact pattern. They work as an amplifier of our Divine Will (other amplifiers are sound and light). This is why Mandala’s are so powerful. Bindu is the center of the Flower of Life and the spark of your Divine Will. A decision by Divine Will creates ripples in space/time: a space/time structure in the reality around you. It forces the Universe to conform to your Will. For instance: put a picture of what you want in the middle of a Mandala (e.g. 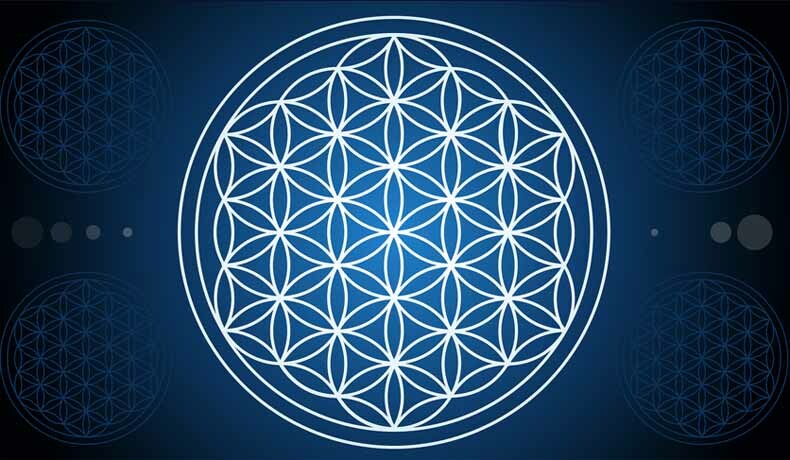 Flower of Life). And even better yet, then put this into a Tachyon chamber (and lots of other technologies) to manifest even faster. With Golden Light one can manifest a perfect life. Manifesting is saying YES to something. Demanifesting is saying NO to something. If you want to manifest the perfect life or your new plan, you need to demanifest anything you don’t want anymore. Example of a demanifestation filter: say NO to people being late for a meeting. Just decide what you will do when they are late, e.g. wait for 15 minutes and leave when they are not there by then. Decide NOT to accept the situation. Or if people keep yelling at you decide that they are not allowed to do this. You will be tested, but when your decision is strong enough, the other person will feel an energy shift, and stop. This is also how you can stop attacks from happening. Just determine that it is NOT part of your reality and it will NOT happen. The process is the same as the manifestation process (decide, invoke and take action). Demanifesting can be easier; sometimes decision is enough. If you are a very powerful being, your challenges are greater. When you become very powerful on a planetary scale, a small weakness can have drastic consequences.